It’s common knowledge that eyes are the window to the soul, thus making eyebrows the frame of the face. The shape of your eyebrows can change how your face shape looks. Pulling your hair back from your face, look closely in the mirror. Measure the length of your face with a ruler. Divide the total length by 3. Measure the length from the bottom of your nose to the bottom of your chin. If the last number is equal to the first number than chances are you have an oval face. 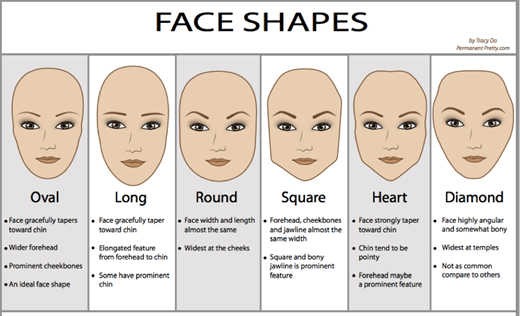 Oval Face: It is the ideal face shape. The perfect eyebrow shape is widely considered to be the soft angled eyebrow shape. by making the face appear longer. The Diamond Face Shape: The curved brow shape will both soften your look and make the widest portion of your face look less wide. Straight: A confident and assertive person — if a woman has straight brows she can be quite masculine. Angled: Sensitive and private, but women with apex eyebrows can also be stubborn. Bushy: Masculinity and an excess of male hormones in a woman’s body. Thin: A feminine, gentle personality. High: If they are too high, they are dreamers. Low: They look too carefully at everything and often don’t have time for others.